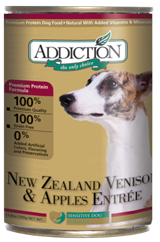 On September 8th, Addiction Foods of Seattle, WA, announced it was doing a recall of two of its canned dog foods; New Zealand Venison & Apples Entree and New Zealand Brushtail & Vegetables Entree. a slight variance in calcium / phosphorous ratios. The limited quantities of affected product was shipped to select distributors and online retailers between February 11, 2016 and March 19, 2016. 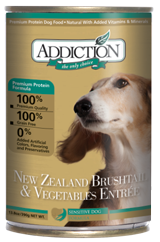 No other Addiction Pet Food products are affected by this recall. To learn more details about this recall and the specific UPC Codes, Lot Numbers and Expiration Dates, click here to go to the Dog Food Advisory website.